Tantipudi Abhilash, MBA 2015-17, Vinod Gupta School of Management, IIT Kharagpur. ‘Harsha bhogle’ this name has been associated with cricket for a long time. Though he is a renowned quizmaster from India and good columnist he seldom got that credit. This Hyderabadie can be a perfect guide to explore the development of Indian and World cricket over the past two decades. Needless to say he has been flawless in his entire career in and out. A sense of seriousness spread after knowing about the termination (not renewing) of the IPL contract by BCCI. The reasons may or may not be spoken out as this constantly leads to the freedom of speech issue in Indian cricket. Thinking of Harsha Bhogle, it would have been rather painful for him as none of the players and commentators supported him. Adding salt to the wound, his co-commentator and ex cabin mate, Sanjay Manjrekar made tweets which would probably hurt him. Well said that, “commentary without him is pizza without topping”. Let us hope that we will be able to eat pizza with full topping soon. In any typical product’s life cycle, there comes a time when it has to face stiff competition or, in general, has to face adverse market conditions. These are generally the defining moments of the parent brand, when just like a human, it tries to find answers relevant to its own existence. Sometimes, the past achievements help it pull out quickly, but many times a vicious cycle may ensue leading to brand value erosion permanently. Brands may perish as a result of this testing. Kodak1 is one such example. HMT watches2 also had its last lot of 5500 watches produced recently. In the present scenario, there are brands which are again trying to build back their trust in the customers. 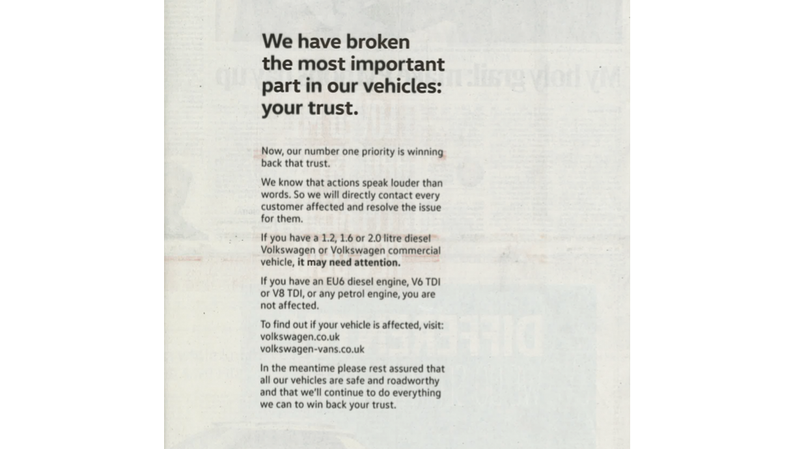 Volkswagen3 is a prominent example in this category which is still recovering from a disaster of ethics which it embroiled itself into. The reasons for failure of big brands can be many. They can range from lack of foresight for judging upcoming trends, unforeseen increase in competition and not heading to true customer needs among others4. However, in the due course of time, some brands have proved their resilience. These brands are discussed in the next write-up. World Intellectual Property Day is observed annually on 26 April. The event was established by the World Intellectual Property Organization (WIPO) in 2000 to “raise awareness of how patents, copyright, trademarks and designs impact on daily life” and “to celebrate creativity, and the contribution made by creators and innovators to the development of societies across the globe”. This date was chosen because it coincides with the date on which the Convention Establishing the World Intellectual Property Organization entered into force in 1970. The theme for this year’s World IP Day is Digital Creativity: Culture Reimagined. This day is observed in India as well by the Indian Intellectual Property Ofiice. The Indian Intellectual property office confers national intellectual property awards on outstanding innovators, organisations and companies in the fields of patents, designs, trademarks, and geographical indications on the occasion of World IP Day every year. Here is where the Kgp connection comes in! IIT-Kharagpur has won an award by the Indian government for being the top academic institute for patents in 2016. According to a news report published in the Economic Times, IIT-Kgp director Partha Pratim Chakraborty said they have received a letter from the Union Ministry of Commerce and Industry saying the institute has been awarded the prize for ‘Top Academic Institute for Patents 2016’. The award will be given on April 26 in Delhi by Union minister Nirmala Sitharaman at a function jointly organised for the celebration of World IP Day by the Indian Intellectual Property office. This recognition is a big shot in the arm for budding innovators here at IIT Kharagpur. It will surely ignite the fire within to work hard and reach an even higher number this year. As the history has it, the world has witnessed the ideological differences emanating from the same set of people which has helped the same set a background for healthy competitive debate and dialogue. As such, there is never anything like intolerance, it is just the swollen reactions of the ones who vehemently oppose or demand something which doesn’t fit into the clutches of propriety, if there are any. Before Modi government took the reins of power at centre, there commenced a set of very inconspicuous events which were resultant of the attempts of right wing fanatics terming the other side deshdrohi or traitor. The university students, who have often been seen as a mascots of communism or radical ideology have been on focus of the attackers group. Universities, especially in capital have been always under the watchful eyes, for most of the political leaders have gestated there. At one side, there’s an extreme positive population suddenly and surprisingly preaching everyone the lessons of presence and at the other, the naysayers. The rift amongst them is resultant of the egos and is termed as ‘intolerance’ by the ones who can’t tolerate peace and harmony. To an ordinary citizen, there is nothing at present in India that can be termed ‘intolerant’, be it propagated from either of the sides. Media unfortunately has made things worse by making this an epic opportunity to grow in times where people are already tired with the cacophony of anchors. Oil’s leading exporters met at Doha on 18th April 2016 to come to a conclusion to cut oil output and boost oil prices. But, the talks ended without any agreement. Qatar’s energy minister Mohammed bin Saleh al-Sada said that the oil producers needed “more time”. Most Opec members attended the meeting except Iran. Iranian officials have repeatedly made it clear they have no intention of participating in a production freeze, though they appear happy to support others doing it. It was expected that Iranian officials would not commit to freezing output at January levels, the point at which nuclear sanctions over Iran were lifted. With Saudi Arabia’s stance of freezing output to January levels only if all OPEC members agreed, it became more clear that an agreement was unlikely to be reached. The failure to agree a freeze is not going to help oil exporters desperate to see the price of crude oil rise. Oil producing countries are facing large issues due to low oil prices. Even Saudi Arabia , despite having significant financial buffers is overhauling its public finances and trying to diversify its economy away from oil. Other major oil producers like Venezuela are in massive political and economic crisis as oil consists of 95% of their exports. Angola which is an OPEC member has even gone to IMF to negotiate financial assistance. The failure to reach an agreement meant oil prices took a tumble and share markets were hit by this development. The biggest concern is that oil price is now hovering at $45.10 from it’s low of $27.10 in Jan , 2016 only with the expectation that ultimately major oil producing countries will agree on freezing oil production levels. But, if OPEC continues to be unable to come to an agreement then it could mean oil prices taking a nosedive again. The next scheduled Opec meeting is in June and it could be a pivotal meeting for the future of a lot of countries and organisations. After being hit by a major controversy regarding its contents, Maggi has already regained more than half1 of the market share in the instant noodles segment. Looking at the pace of the recovery, it is pretty clear that Maggi has been able to retain its powerful positive image in the minds of Indians, despite all odds. Similar is the story of the Netflix, the US-based global provider of movies and TV series streaming services. After nearing a meltdown, Netflix bounced back from a near split2 into two companies. It has recently entered India as well. Even behemoths like Tesco have to rejig their strategies for fighting competition. It did this recently by cutting prices, improving availability and customer service3. The result of this was that its sales – for the first time in three years – went up 0.9% in the fourth quarter of the previous financial year. So how can brands ensure their continued dominance? Perhaps three things4 can be reinvention, having adequate back-up fire power to take risks and the vision to achieve big. The subtle and calm Bengaluru was disturbed by the garment factory workers, to protest against the PF law. The protest started at one factory where a copy of newspaper article regarding the law was published. The information snowballed the factory workers protesting leading to more than one lakh people joining the protests, which even the trade unions did not expect. The new law says that the workers cannot withdraw contribution from PF till 58 years. These factory workers earn very little and the employee PF is the only form of the backup security for these people. If the government ceases this right then these workers would not have anything to spend in case of emergency. Adding to this fact is the availability of quality healthcare and education is very limited for this class of people. Since the unionization is prohibited and the revision in labor laws in the state, there little importance given to the employee by the owners. This law though created to benefit the employee in long term, is creating more discontent to the citizens it was intended to. This incident also shows that there is high level of discontent among this income class with respect to the laws which affect them. The government has to take all these issues into consideration and then enact the law. For future laws it is important for government to consider the sensitive issues and problems faced by workers before any law change . Becoming the first Indian female gymnast to qualify for the quadrennial event is not an achievement to be taken lightly as it brings glory and pride to the country. Apart from being the first Indian woman, she will also be an Indian gymnast qualifying for the quadrennial extravaganza after 52 long years. Her achievements have drawn nationwide acclaim, with India’s sports minister Sarbananda Sonowal praising her for taking gymnastics in the country to ‘a new high’. The first Indian female gymnast to win a medal at the 2014 Commonwealth Games and follow it up with another bronze at the Asian Championships in Hiroshima, she also reached the final round of the 2015 World Championships and finished fifth. ‘On the day of the finals my leg was badly swollen,’ she said. ‘Everyone advised me against doing the vault. But I had to do it. I had to take that risk, because only after doing the toughest vault would I win a medal.’ Such is the level of inspiration and the passion she has for her sport. Indians are still in disbelief about her medal-winning potential, though the girl always knew she was gearing up for something big. The sport of gymnastics has been in turmoil in the country in the last few years with rival factions holding elections and claiming to be the national federation. Even the camps for the gymnasts has been held under the aegis of Sports Authority of India. She thought of bringing the change and mastered the world’s most difficult gymnastic vault. Hope she continues to bring glory to the nation and keep up her passion and zeal for the sport. She truly is an inspiration for many of us. What happens on Watsapp stays in Watsapp? The recent Apple vs. FBI case was an example of the company having to deal with dilemmas like choosing between security and privacy. The case has helped organisation have different strategic alternatives to avoid this dilemma. Watsapp now displays messages saying “Messages you send to this chat and calls are secured with end-to-end encryption.” This means that no one including the government authorities or the company personnel are able to get the data in these chats. This is a major leap towards protecting the privacy of the people. But there might be hindrances between different governments with respect to these cases. Even though on outer side it looks like company is protecting the privacy of people, the implication is a little different. This is implement to avoid the situation of the ethical dilemma. If the data is available with the company then it can be accessed by any organisation with warrants from the court. SO effectively the company is avoid this ethical dilemma of choosing between two difficult options. This law in fact makes the job of the government officials harder than ever.